The new issue of QANE is available! 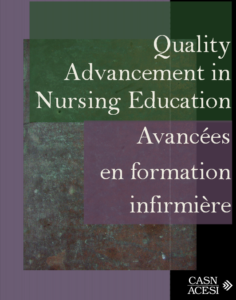 Quality Advancement in Nursing Education - Canadian Association of Schools of Nursing / Association canadienne des écoles de sciences infirmières (CASN / ACESI). The Co-Editors in Chief of Quality Advancement in Nursing Education are pleased to announce the publication of issue 4.2! The aim of this journal is to provide a forum in which to address questions and issues related specifically to quality advancement in nursing education. The mandate of the journal is to promote excellence in nursing pedagogy through research, theoretical, and policy papers. These papers address assessment, indicators and standards of quality nursing education, evaluation, program modality outcomes, and the nature and key elements of educational quality.